For developers or owners who have never built on an Indian Reservation, the advantages of locating a private business on leased land may seem unfamiliar, but the Ak-Chin Industrial Park Board will assist you with every step of the process and help alleviate any anxieties. Currently, Ak-Chin’s industrial park covers approximately 130 acres. With underground utilities and fully improved roads, Santa Cruz Commerce Center is an Arizona Gold Certified Site and the largest improved industrial park in the Maricopa area. Approximately 45 acres of shovel-ready lots are immediately available for owner-built or build-to-suit projects for qualified tenants. 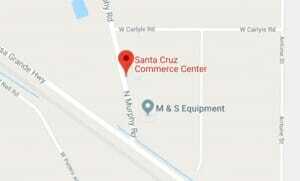 Want the basic information about Santa Cruz Commerce Center? Land lease prices are competitive with rural areas adjacent to Casa Grande, StanVield, and Eloy, and SCCC offers a better location. The Ak-Chin Community provides fire and police protection throughout the Reservation.